Elderberries are one of the easiest shrubs to grow. Not only are they attractive plants, but they yield edible flowers and fruit high in vitamins A, B and C. Native to Central Europe and North America, the shrubs are commonly found growing along the road, forest edges and abandoned fields. 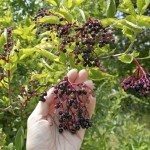 What types of elderberry plants are suited to your region? Recently, newer varieties of elderberries have been introduced into the market. These new elderberry bush varieties have been bred for their ornamental characteristics. So now you not only get the lovely 8- to 10-inch blossoms and prolific dark purple fruit but, in some varieties of elderberry, colorful foliage as well. The two most common types of elderberry plants are the European elderberry (Sambucus nigra) and the American elderberry (Sambucus canadensis). The American elderberry grows wild among fields and meadows. It attains a height of between 10-12 feet tall and is hardy to USDA plant hardiness zones 3-8. The European variety is hardy to USDA zones 4-8 and is significantly taller than the American variety. It grows up to 20 feet in height and also blooms earlier than the American elderberry. There is also a red elderberry (Sambucus racemosa), which is similar to the American species but with one important difference. The brilliant berries it produces are poisonous. You should plant two different elderberry bush varieties within 60 feet of each other to get maximum fruit production. The bushes begin producing in their second or third year. 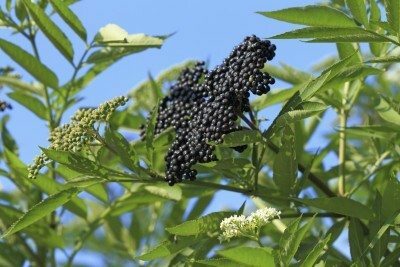 All elderberries produce fruit; however, the American elderberry varieties are better than the European, which should be planted more for their lovely foliage. ‘Beauty,’ as its name suggests, is an example of an ornamental European variety. It boasts purple foliage and pink blossoms that smell of lemon. It will grow from 6-8 feet tall and across. ‘Black Lace’ is another spectacular European cultivar that has deeply serrated, dark purple foliage. It also grows to 6-8 feet with pink flowers and looks very much akin to a Japanese maple. Two of the oldest and most vigorous elderberry types are Adams #1 and Adams #2, which bear large fruit clusters and berries that ripen in early September. An early producer, ‘Johns’ is an American variety that is a prolific producer as well. This cultivar is great for making jelly and will grow to 12 feet tall and wide with 10 foot canes. ‘Nova,’ an American self-fruiting variety has large, sweet fruit on a smaller 6-foot shrub. While it is self-fruitful, ‘Nova’ will thrive with another American elderberry growing nearby. ‘Variegated’ is a European variety with striking green and white foliage. Grow this variety for the attractive foliage, not the berries. It is less productive than other elderberry types. ‘Scotia’ has very sweet berries but smaller bushes than other elderberries. ‘York’ is another American variety that produces the largest berries of all the elderberries. Pair it with ‘Nova’ for pollinating purposes. It only grows to about 6 feet tall and across and matures in late August.